These chairs are very attractive on any porch or patio! 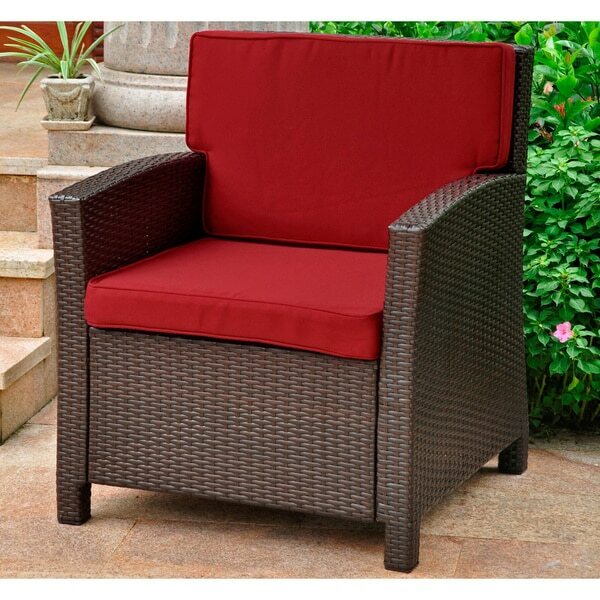 Add the classic beauty of wicker with modern easy care to your patio or porch with this contemporary outdoor chair. The tough resin wicker construction creates the illusion of natural wicker, but it resists moisture, mildew and UV damage. Topped with bright-colored cushions, this solid-looking resin wicker outdoor chair is just right for brightening your favorite outdoor space with a usable, relaxing seat. Dimensions 27.0 In. X 14.0 In. X 31.0 In. Bought these chairs in May. They are in the sun for only a few hours a day. Cushions are totally faded! Contacted Overstock and they would not do anything to help! DO NOT BUY THIS PRODUCT! Total waste of money. I have four chairs that look horrible after 5 months!!!!!! 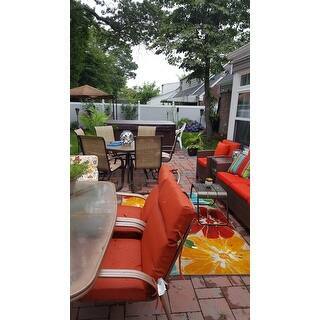 I love these Resin Wicker Outdoor Contemporary Chairs with Cushions. I choose the red cushions. Very comfortable. Very durable. I would order again! When it came to assembly, the alignment was off, I actually had to use a pair of pliers to pull metals parts so the screws would go in properly. Also there were 2 plastic weaves that were not attached and I had to use super glue. The chair is comfortable and looks nice and the cushions have been through a harsh rain and dried out quickly with no smell. However, with assembling and the weave being loose, doesn't justify the price. Very comfortable chair that sits on my balcony. It's been rained on a few dozen times but the cushion and wicker seem good as new by the next day. I've had this chair in the wine red color for about 5 months exposed to the elements and looks the same as when i bought it. Only four stars because there is nothing holding the cushions on to the wicker, and they slip down/off pretty easily. This is a good product. I was trying to match a patio set that needed a chair and this worked perfectly! Over time the back cushion has faded a bit and gotten smushed down because it's a bit thin, but the wicker part has held up wonderfully. I would buy it again. I am enjoying these well-priced, sturdy, smart looking chairs on our patio. Assembly wasn't terribly easy but manageable. Love the fabric, too. I have a balcony deck on my new place and wanted some durable furniture to handle the hot humid days of summer along with the rainy spring weather. This chair has been perfect. It looks great and has withstood all types of weather conditions. If I had room for another, I would buy again in a heartbeat. I love the look of these chairs and I am happy with the quality. They were quite easy to put together. The cushion are adequate although I have the chairs on a covered deck not exposed to the direct sun. I would purchase more of these chairs. I love the style and the look; but within 2 weeks my cushions were totally faded out and the chair does not sit level. I bought the sofa and the chair. It looks good except for faded cushions that I will now have to replace; but fpor functionality...it is lacking. Great chairs for the price! The are comfortable and look good. I bought clear plastic sheeting and covered cushions to help protect from weather and animals. Love these patio chairs, they look great! One arrived damaged. Beautiful but we quickly realized that the fabric was not fade resistant. Cushions could be thicker. "What is the weight capacity of the chair?" "Since this item is made in China (awg)... Do the cushion's materials contain chemicals that can produce cancer? I just had to return a patio chair to another Company because of this reason." "What is the width of the seat cushion and what is the high of it off the floor?" The seat height is approximately 14 3/4 inches and the cushions measure approximately 22 inches x 22 inches x 3 inches thick. "Are replacement cushions available? I purchased 4 chairs and the love seat. My cushions have faded." Yes, replacement cushions are available under item number 17207598. "Does anyone know if the cushion covers unzip?" The cushion covers have a zipper. "What's my recourse if this falls apart within a few months of continued use." Hello Jan D., you will be contacted by Customer Care. Have a great day. "How duriable is this chair and waterproof. Busy patio with grandchildren." Hello Jan D., this is a wonderful option! It's durable and weather resistant. Thanks for shopping with us!